Constructed of heavy-gauge rust-free aluminum, this reflective No Trespassing sign is rated for at least 7 years of no-fade outdoor service. We silk-screen print this our stock Private Property No Trespassing signs with 3M transparent outdoor and UV resistant inks on 3M Engineer Grade Prismatic reflective sheeting mounted on heavy-gauge aluminum for many years of non-fading service. 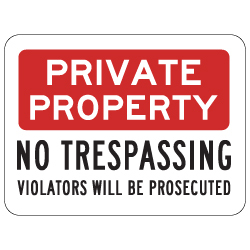 This Private Property No Trespassing sign is also available in a smaller, 18x12, size for posting below 7 feet. DOUBLE the working life of your 3M Reflective No Trespassing signs by adding 3M Protective Overlay Film (POF)! 3M’s high-tech POF protects sign faces against fading caused by the sun and harsh weather—and makes graffiti and sticker defacement damage easy to clear away without harsh abrasives.